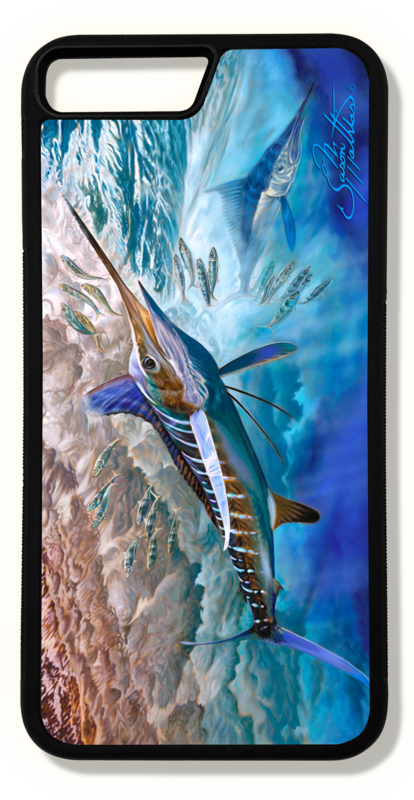 iPhone 8 plus case "White Marlin"
iPhone 8 plus fine art phone case by artist Jason Mathias: Carry around this unique piece of personalized art of a brilliantly lit up White Marlin and Spearfish stalking a school of sardines while protecting your phone all at the same time! Our phone cases provide superior quality when compared with other slim silicone rubber cases. Our case provides a layer of silicone protection- and an extended lip to protect your phone screen from touching or rubbing on surfaces. Our cases also have a comfortable textured grip and easy access to all buttons and plugins. The art plate is extremely tough, a well shielded sublimated aluminum fine art plate that wont fade or scratch. Case provides effective protection from dust, damage or any other unexpected situations. iPhone 8 plus case "Reflective Chaos Marlin"
iPhone 8 plus case "Seaweed Salad Mahi"